Uneventful trip to the airport starting with 0611 Telford-Birmingham (hot 153), and the Virgin from Hell (see 4.2.99) which aarrived on time at New St but was just late enough to miss the no 12 bus at Coventry. The 19W was caught instead. A day’s work followed, then taxi to Tile Hill and 1710 to Birmingham International. BA did well with a 30 minutes late departure, lots of boasting about regaining time, and a 30+ minutes late arrival. Good job I hadn’t gambled on 2245 kipper to Berlin as I didn’t reach Düsseldorf Hbf until 2300. I fell into the Ibis which was doing summer rate of DM100, rang HQ’s answering service, had a Diebels Alt – better than I remembered – and retired. After the 1139 Dessau had left at 1305 the 1206 Loburg made it to P6 and left at 1323, allowing just enough time for the special to Altengrabow at Loburg. Except that, at Büden, the Ferkeltaxi failed. The conductor didn’t speak English but I gathered what he was saying (e.g. ‘Kaput’) and he despatched a kindly English speaking Berliner to explain. She said she had to get to Loburg and was going to get a taxi to Loburg which all (4 of us) were welcome to share. It turned out that there was one other would-be railtour patron. A taxi was ordered (DM90!!) but before it appeared a) we found out that the railtour was cancelled and b) the 1406 ex Magdeburg appeared. Nothing for it but to go up to Loburg for the track (and a couple of photos) and back to Magdeburg. 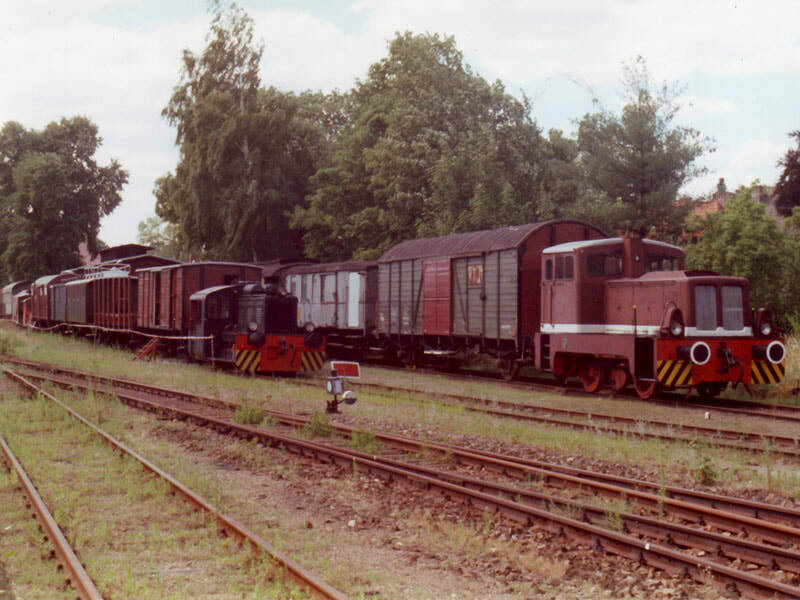 There is a collection of stock and three small diesel shunters at Loburg, nothing else visible in terms of tour haulage. The unit seemed to be causing the driver some concern but managed to stagger back to Magdeburg on time (the dead one had disappeared from Büden). 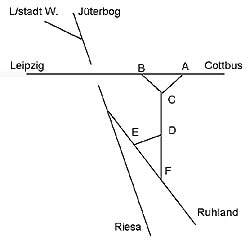 All possibilities were investigated in the K-Buch but only the 1801 IR to Cottbus would work. A food and beer stop was therefore taken before the IR arrived. This was well filled and in my ‘grossraum’ was a party of 55-65 year olds who proceeded to get louder and louder, swilling beer and schnapps, hanging out of the windows yelling to their friends and ending up with some (I assume) highly traditional drinking songs. Half of them were women, too. Amazing. Berlin was absolutely heaving. Main roads closed, masses of people everywhere. An astonishing sight – it would be interesting to know how many there were. Half a million would be no surprise. Whatever it is it’s quite an event – on the face of it it seems to consist of the girls wearing not a lot and the lads dyeing their hair bright colours and shouting and whistling a lot. Must be more to it than that but it’s harmless and entertaining to look at! [In retrospect my guess at the numbers was rather conservative; it seems 1999 was the high spot for the Love Parade, with the organisers estimating anything up to 1.5 million people. Subsequent years were less popular, though even at the last one in 2003 the estimate was still 800,000.There’s a potted history at http://en.wikipedia.org/wiki/Love_Parade Reviewing these notes again in 2008 I find that the Parade has had a turbulent few years and has now found a home in the Ruhr, with the 2008 event planned for Dortmund (2018: following a tragic accident at the 2010 event in Duisburg, resulting in 21 deaths, it was announced that no further Love Parades would be held) ]. The noisy brigade decamped at Ostbf and left me to worry all the way to Cottbus. With such a huge event the possibility of peripheral towns being booked solid seemed a realistic one. On arrival at Cottbus (13 late) there was no hotel info to be had, and no street map. Fortunately I noticed a ‘Zentrum’ sign in the car park or I would have gone the wrong way. To cut a long story short, Zur Sonne was eventually located and proved very suitable, also obliging about an 0700 breakfast on Sunday. I repaired to the Altstadt as usual and found a suitable (though hideously noisy) pub purveying some kind of weissbier. I managed to avoid the ‘Irish Pub’ opposite. A good start at least. Breakfast was all ready to go at 0700 and very comprehensive. Bill paid, I walked back to the station, purchased a Wochenendeticket and a single Guben-Czerwiensk (to avoid potential difficulty with Polish grippers) and still had 25 minutes to spare. ‘Love Paraders’ were still straggling home, very quietly. I noted that the returning special to Cottbus left Lichtenberg at about 0430. A grim place at the best of times, but 0430… The DB paras were rousting out those kipping on benches and demanding their tickets, which seemed a bit churlish to me. One day a year, they could overlook the odd dosser. An electrically propelled double decker ran to Guben, with on time arrival permitting a call to HQ. Immigration was done – two platform seats, Germans on one, Poles on one, and two passport checks! The train to Czerwiensk and Zielona Gora was a PKP diesel [I wonder who else's diesel I was expecting when I wrote that!] and two well worn ex main line coaches. Major communication difficulties at Czerwiensk, but eventually a ticket appeared (with linguistic help from a local). PLZ 9.90 or thereabouts to Zary. I was advised to travel on an earlier service than planned. This proved good advice as there was an earlier train from Zielona Gora which (if I’m on the right train – watch this space) should lengthen the 3 minute connection at Zary to a beer’s worth! It did, but one pub wasn’t open until 1300 and I couldn’t find the one I saw from the train. Zary has a modern hotel opposite the station (looked shut but probably wasn’t) and given a few billion zlotys it would be a nice old town. The comparison with Cottbus or Zittau, which probably looked much the same in 1990, is amazing. The 1245 to Forst (PKP diesel again, but a smaller one) turned up promptly and provided a fairly dull trundle back to Forst, where it was 4 or 5 late. With an 8 minute connection and immigration to do this should have been of concern, but for some reason wasn’t. In the event I got there with over a minute to spare, just as the 219 was started up. On arrival at Cottbus a fruitless and very hot walk was taken to Zur Sonne which was closed for the afternoon. A very pleasant air conditioned ride was had to Lübben where the parish notices revealed a bustitution between Lübbenau and Calau, ending at midnight. I caught the Calau train back to Lübbenau in case it did the connection (it did) then retired to Cottbus on another cool RE. What was then left of the plan involved going to Bad Liebenwerda and on to Falkenberg, thence back to Cottbus via Calau. At the time of writing (1810) the 1759 hasn’t appeared yet at Bad Liebenwerda so the 12 minute connection looks like a non-starter. Next to arrive was 1834 Guben which I let go, still believing the 1759 might appear, but when the 1913 Leipzig appeared I caught that. It did the curve up to the high level at Falkenberg where it changed locos (219 -> 1xx). Delayed by single line working, arrival at 2100 allowed adequate time to book in at the Ibis and get a McDonalds. A beer was in prospect but as the building adjacent to the likeliest looking pub had caught fire whilst I was in McDonalds, I decided to retire to bed (through the rain) instead. Not the best day ever, but the cross border lines were good. After so many departures from plan, the plan concept was declared null and void. Upon rising at 0730 [sounds like Leipziger Berti] the 0835 to Miltitzer Allee returning via Gaschwitz was decided upon, to finish the Leipzig S-Bahn rather belatedly. Miltitzer Allee – loadsatowerblox. One of those lines best done and forgotten about, like in Sahf Lundon. Inevitably Markkleeberg-Großstädteln, where I had to change to be sure of the connection, is north of the physical junction (though well south geographically) but that’s something to do one evening when there’s nothing better. On the other hand the Gaschwitz shuttle has its own bay at Leipzig-Plagwitz and gets a physical connection with the Miltitzer Allee-Plagwitz line so that one worked out better than expected. It didn’t take long for the day to go pear shaped. The alleged 1015 IC to Riesa rolled in at 1030 and proceeded to go slowly to Riesa with stops outside Wurzen and (longer) Oschatz. Amazingly the 1101 to Elsterwerda was held but it trundled along at its own pace and arrived 19 late, with the connection at Elsterwerda-Biehla gone and the plan, such as it was (E-Biehla to Falkenberg thence to Cottbus) wrecked. There is, fortunately, an 1152 from Elsterwerda to E-Biehla. 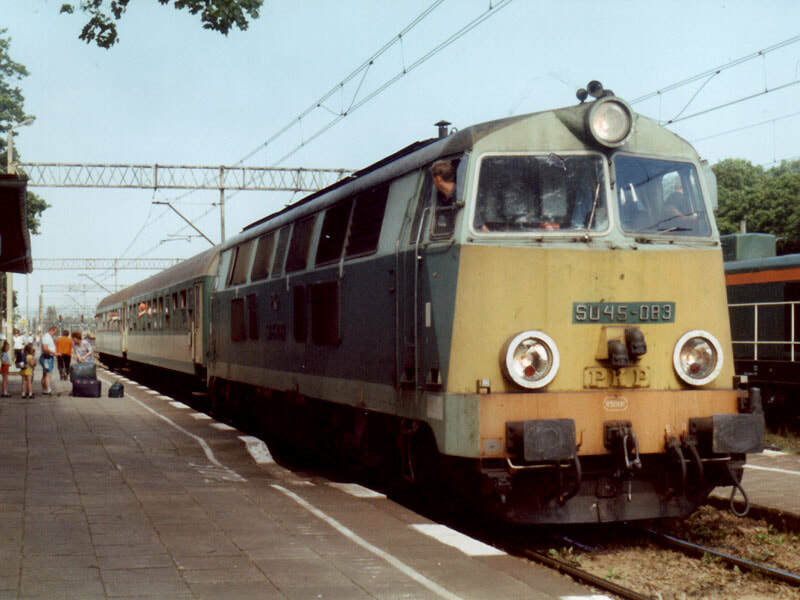 This was taken (it does the physical connection) – and was somewhat overprovided with a 143 and 4-coach Airport Express set with double deck driving trailer. For 3 people. Next available train was waiting at E-Biehla (dep 1158 IIRC) and was taken as far as Senftenberg. At Senftenberg the best bet seemed to be 1248 to Lübben, have a beer, back to Cottbus, out to Falkenberg, down to Bad Liebenswerda from the low level, and back to Cottbus for the night (and Peitz). We’ll see. So far so good. At Calau the up Lübbenau trains (towards Berlin) have a separate platform which seems worth doing. The engineering works were very apparent between Calau and Lübbenau with a long TSR and consequent late arrival. There is a large disused industrial system serving a large disused industry, with four steeple cab four axle electrics seemingly waiting for scrap (belonged to Laubag). There is also an apparently used and non-electrified freight line going off to the west. The beer strategy worked too, with a large Paulaner pils in a very pleasant station buffet. Food seemed OK too, and I may yet regret not having any! Something’s obviously gone horribly wrong. The 1445 (ankunft 1444) to Cottbus arrived at… 1444. Was it hot? Ever so slightly. A paper on board suggested that other than Malaga and Istanbul, Berlin at 30° is the hottest place in Europe today. Just my luck. [As well as pasta, I really, really dislike heat, particularly of the humid variety.] Also noted during the day: 2 defunct fireless locos at Wurzen and one at Vetschau. Also a class 150 on a freight at Ruhland - these look fairly ancient. A 10 minute wait at Vetschau saw off the punctual running but with 30 minutes at Cottbus, not of itself a problem. It was caused by a late running northbound IR on the single track section. Well, the best laid plans. Nice platform lady has just informed me that 1731 to Bad Liebenwerda is cancelled, like yesterday presumably. The saga will therefore continue with the 1817 RE back to Cottbus via B to A! In the morning, yet another trip to Senftenberg with the aim of doing F to E. And there’s no connection south of the station either. After rebooking at Zur Sonne the 2006 to Peitz seemed a good idea to avoid a hideously early start tomorrow. Not tremendously exciting, the line being mostly straight and level (to be fair, there are two bends near Peitz). 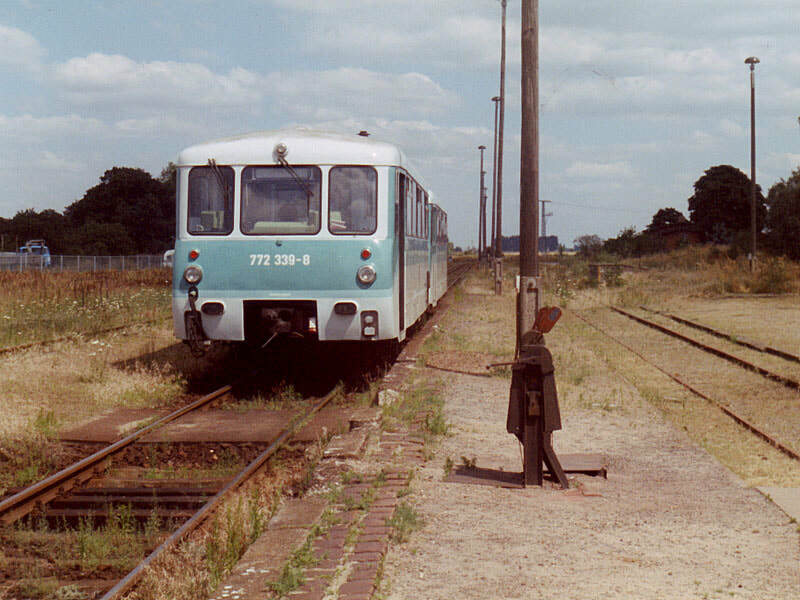 The line used to continue beyond the station [to Grunow and Frankfurt (Oder)] but is now out of use; the railcar uses the loop. Back at Cottbus there was at last a chance for a meal – schnitzel and weissbier were taken at ‘Bistro’ in the Altmarkt. Cottbus seems very pleasant and intact – somehow it hasn’t quite done the job that some other towns (e.g. Zittau) have, but it’s getting there. Into bed by 2230 for an 0730 breakfast. No trace of yesterday afternoon’s rain – back to swelter mode. Purists should note the need to do Calau-Senftenberg southbound some time. There is a long burrowing junction (and the physical connection is west of Sedlitz Ost, so change at Senftenberg!). This was noted from 0834 Cottbus – Jüterbog which for some reason was throwing shadows the same side as the sun. Must be something in the profile of the double deck stock. 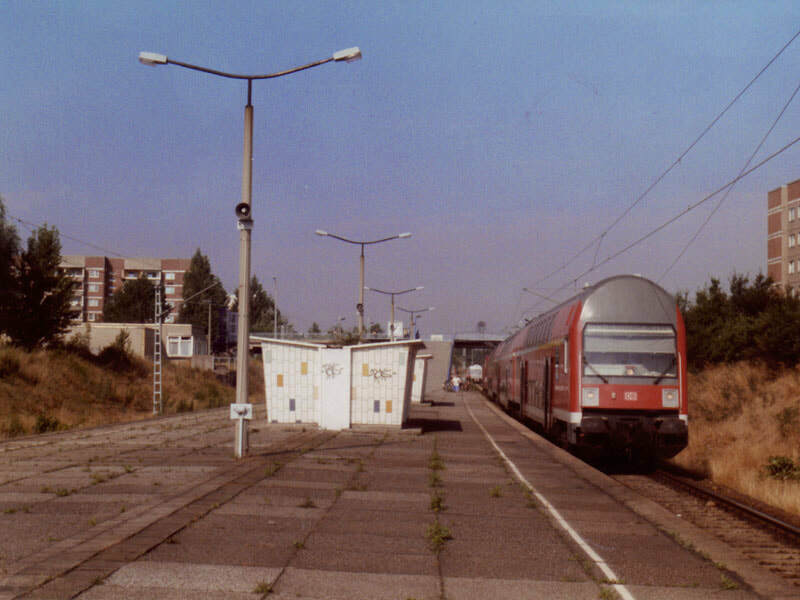 Though delayed waiting for the platform at Bad Liebenwerda, the ‘straight side’ of the triangle (see 12.7.99, F to E) was satisfactorily done, leaving just KBS 216, Lutherstadt Wittenberg to Riesa, to do through Falkenberg. KBS 204 and 216 seem to cross on the level at Falkenberg with 216 subsequently flying over from east to west. On arrival, by train, at Jüterbog the parish notices clearly showed a bustitution between Oehne and Jüterbog. Good thing it didn’t happen – this would have been a seriously irritating gap. Almost an hour to wait for a connection on to Berlin Wannsee which was a 2 car set pushed by a 219 and had a pleasant amble through the countryside, doing a reasonable trade at Beelitz but not much else. Clouds were gathering by Wannsee but to no effect - still hot. The 7 minutes or so in and air conditioned RE to Potsdam Stadt were wonderful but Potsdam Stadt then seemed even hotter. An RB (another 2 car, pushed by an electric) formed 1426 Potsdam to Berlin-Spandau via Wustermark. This was a gamble, that by getting off at Wustermark I wouldn’t lose any track. Wrong – the NBS is on a separate alignment so one day I’ll have to do Spandau – Wustermark and back. No great loss – the whole thing could be done in under an hour. Onwards by RB to Stendal (changing at Rathenow) in order to do the old alignment all the way, leaving the NBS until later. At Wustermark the NBS is concrete paved track with concrete blocks placed between and beside the rails. They don’t seem to be fixed and I could only guess at noise reduction. The ICEs (two while I was there) still make quite a noise. Hmm… more complicated than I thought. Although an RB, this one didn’t stop everywhere. You need to do an all stations, certainly towards Berlin and possibly back. There are also the IR services which stop at Rathenow, which presumably do a fast to platform connection. A bit technical, this, but the old alignment’s worth while. I did. Some heavy duty donner und blitzen also came on around Schönhausen and what with full sound effects from an 8 minutes late Rabbit, it was all quite exciting. Stendal looks highly suitable for an overnight, with the Hotel am Bahnhof across the road. [It is. I’ve stayed there a couple of times since for various reasons.] Fortunately I decided on/decided against/decided on continuing to Braunschweig to give myself more possibilities tomorrow, as the mother and father of thunderstorms came on and I would have got half drowned coming back over the road. Parish notices at Rathenow had revealed bustitution for the Brandenburg Ferkeltaxien for the whole of July so the inconvenience of the Belzig - Brandenburg - Rathenow timings was a blessing in disguise. Also noted between Rathenow and Stendal was the flying junction off the NBS - looks like Stendal to Rathenow needs to be done both ways by IR. Final decision was the 1706 to Salzwedel, thence 1808 to Oebisfelde, and 1955 Oebisfelde – Braunschweig with fingers well crossed. Salzwedel (which I’d done as far as Hohenwulsch on 4.4.99) was very dull. Cornflake country. No junction problems at Salzwedel; it’s a simple two island platform job with loops, and the junctions well away. The Oebisfelde service was 772 + 972, extremely hot and consequently fairly tedious for almost 1½ hours. Quite a nice line though, with traffic at the ends (a bit) but not in the middle. The loss of the middle bit would be no surprise, given that what freight there is, is also on the Klötze - Oebisfelde section. The physical junction at Oebisfelde is before the station (and what a dump it is). Oebisfelde to Braunschweig took an hour thanks to a 20 minute stop at Wolfsburg. All the charms of Dagenham as you might expect [Note for non-Brits: Dagenham is (or was) a Ford car town like Wolfsburg is a VW one]. The Rabbit was fun, the drunk who had trouble getting on the train and insisted on smoking, less so. The Hotel Fürstenhof in Braunschweig obliged with the ‘summer rate’ of 120DM. Strange, he charged me 119 on 10.4.99. I had a wander round the supposedly rebuilt center of town which actually contains some lovely old buildings, and finished up with a Franziskaner. A solid day’s track at last, and all according to plan (albeit the plan was a bit vague at the end). After securing a reservation for 1402 ICE Hannover – Düsseldorf (DM5 now, too many no-shows presumably) I set off on a 614 (you can see out of the front if the blinds aren’t down) at 0723 to Vienenburg. On arrival there was time to look at the museum’s outside exhibits (stuffed 52, some diesel shunters and rolling stock) and read the parish notices which warned of delays between Vienenburg, Bad Harzburg and Hildesheim, plus (I think) Halberstadt and Vienenburg. In the event 0846 to Goslar turned up 10 minutes late and on the wrong platform. It was not further delayed, and went by the direct route to Goslar so presented no problems with a 30+ connection there. Goslar looked well worth a visit - plenty of hotels but rather posh and touristy so possibly not a good place for an overnight. On to Kreiensen in a 2 car DMU with none of the threatened delays, allowing half an hour to admire Kreiensen’s station building again (see 11.4.99) and observe that you can do the connection between Braunschweig and Göttingen lines. Hannover - Paderborn seems less likely. The (fairly full) RE to Hannover was a few minutes late but nowhere near enough for a problem. Hannover Hbf is undergoing major surgery and is a complete shambles with all sorts of Portakabin type shops outside. DB started to revert to type with a 5 minute late RE for the 9 minute connection at Haste, but I needn’t have worried since the connecting train round the loop to Weetzen and back to Hannover left 7 late. This was of some concern to the plane-catching classes but the train stayed 6-7 late most of the way round the loop, eventually arriving only about 2 late with a very generous 7 minutes allowed for the last 3 km. The ICE was more or less on time too and though it dropped to about –6 at one point it was –2 at Düsseldorf. With that I repaired to the airport on 1725 S-Bahn to await the flight to Brum (currently 11 min early inbound according to the screen. I’ll believe it when it pulls up outside.) It wasn’t, but returned to BHX more or less punctually, thence back to Telford courtesy of Silverlink and CT. I'd already missed the Rosswein-Niederwiesa line due to late running on a previous trip. This year's closure threats for December included the remaining portion of it, between Niederwiesa and Hainichen. Always anxious to visit the parts that others don't, I set off for a pre Christmas visit to Germany in December.